Due to the H-cap on top, they really need to get up top and take this off. casting around for alternative ideas, I stumbled across this: the Gardus Inc RCH205 Sooteater Rotary Chimney Cleaning System. Normally the cost of shipping large items from the is a major reason for not ordering something like this but I couldn’t find anything even close anywhere closer and the shipped price wasn’t much more that the price of conventional hand brushes bought locally. Because the flue is so long, I thought it was also a good idea to invest in a set of extension poles. Delivery down under only took five days, something of a record I think, especially since that involved rural delivery as well. Even though they arrived two weeks ago, I’ve had to wait for a nice day off to try them out. Less the drill this is what you get: six poles = two more in the extension set, the rorating head, comprehensive instructions in English and French; and a sheet of clear plastic to cover the mouth of the fireplace to keep the dislodged soot in. 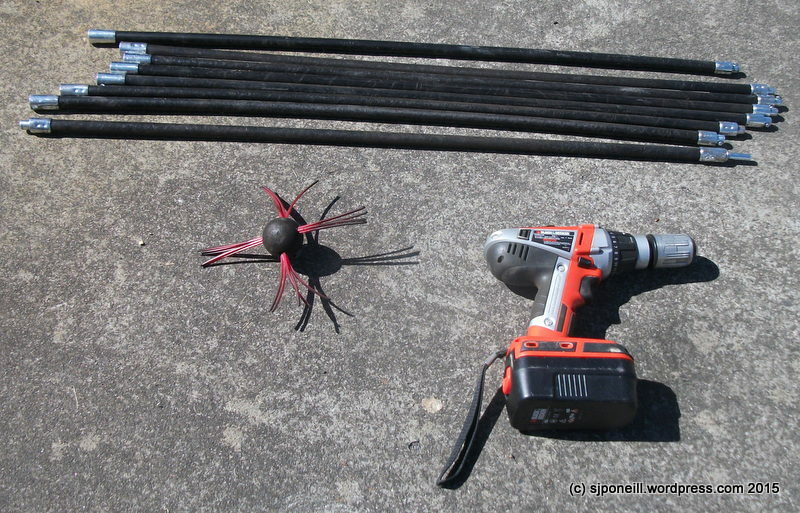 There’s also an adaptor that connects the poles to any common hand drill; and a hand tool for depressing the detent on each pole to release it from its mate and allow the assembled poles to be broken down. There are no Allen key-ed parts so the Allen key on the not-pointy end is a bonus.
. …and the poles had to be assembled. This is a simple clip system but I had to make two sets as I didn’t have room in front of the fire place to lay the whole length out. I didn’t use the plastic sheet but placed drop cloths over the couches just in case things got messy. As it happened I needed have bothered. The whole process was pretty painless. I had the garage vac running in the fire box – while it didn’t pick up a lot of the debris as it fell, it was great and sucking up the dust and keeping that bfrom floeing into the lounge. Use was easy – don’t know why I was worried about this. Hooked the drill up to the first length, guided the cleaning head into the chimney and away we went. After working the heading up and down a couple of times, I added in the next length of four poles and up we went, all the way to the top. As expected the greater amount oif debris came from above the roof line we I suspect the colder air and metal has been encouraging the smoke to scale against the insides of the flue – certainly the second half resulted a lot more debris coming down. The shaft spun easily in my hands and runs up and down the flue with no problems or stoppages. 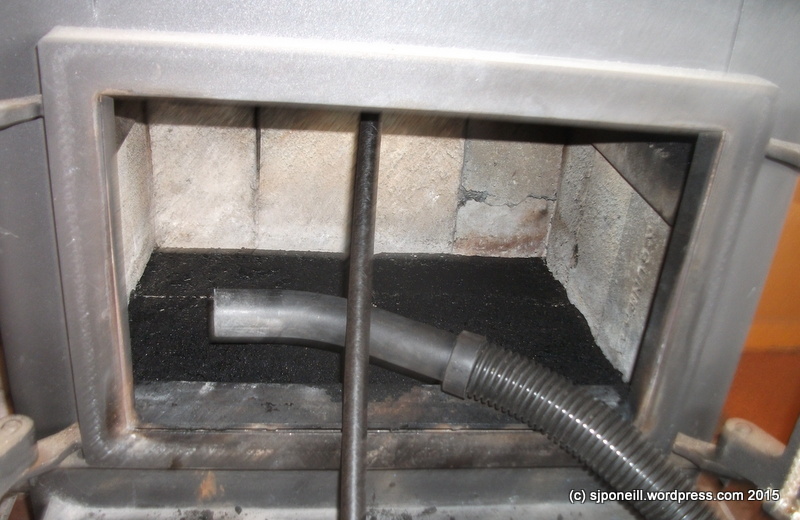 Once the the flow of sooty debris ceased, I reversed the process and brought the shaft out by sections. It had cleaned out a lot of soot and scale, enough to fill a vacuum bag, maybe 2-3 kilograms. The only question is whether there are any obstructions in the H itself – hope not as otherwise we will be needing to get someone in as this is not a roof to be casually scaled – the test of that will be tonight. If the H is part of the problem, it’ll be replaced with a conventional straight through cap so the shaft can push all the way out the top. The set all broken down – took less than five minutes – and ready to go away. Clean up inside only took another five minutes or so. I don’t know why a tool like this is not readily available here as it is a quick and simple way of performing a dirty task that also keeps homes safe by reducing the risk of chimney fire; and contributes to home health by enabling fires to burn warmer and more efficiently. This entry was posted in Playing with Toys and tagged Maintenance, Raurimu Lodge by SJPONeill. Bookmark the permalink.